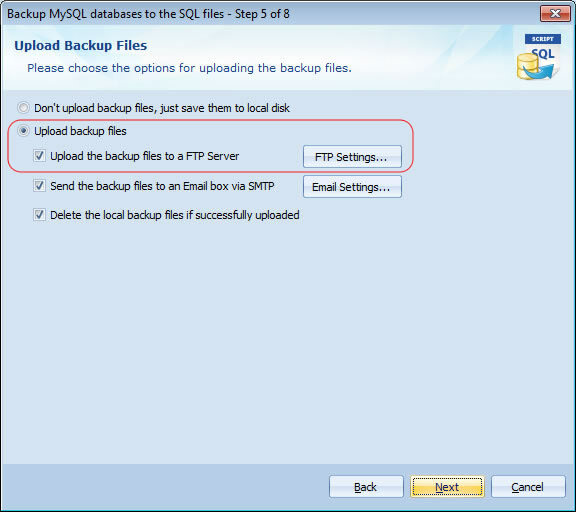 Automatically back up MySQL database and upload the backup files to ftp server. Automatic Backup Scheduler for MySQL > Tutorials > How to back up MySQL database to FTP server automatically? Make a double protection for your important MySQL database is recommended by many experts. Upload the MySQL backup files to a remote FTP server is a good choice. You can restore your MySQL databases from the remote FTP server if the local host crashed. Automatic Backup Scheduler for MySQL allows you upload the MySQL backup files to your remote FTP server automatically. It supports resume broken transfer, you can set up the transfer times and wait time for everytime, if the transfer still failed, the software will record the error information. And it supports Proxy Server. Select the databases and items which you want to back up. Set up the backup file options. 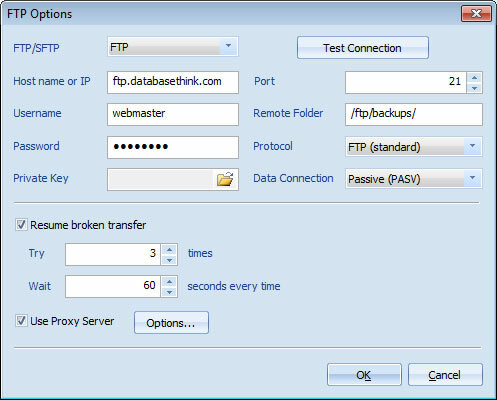 Step 3: Choose the option Upload the backup files to a FTP Server. Please choose the option Upload backup files and Upload the backup files to a FTP server on Step 5 of the Task Wizard. Please click FTP Settings... to set up the FTP options. To reduce the localhost disk usage, you can choose the option Delete the local backup files if successfully uploaded. To reduce more disk usage, you can choose Incremental Backup on Step 3 of the Task Wizard or compress the MySLQ backup files to ZIP/GZ on Step 4 of the Task Wizard. Step 4: Set up the FTP options. Please enter the information of your FTP server. If you have no idea about the information, please contact your FTP provider. FTP/SFTP: Select the type of you FTP server ( Support FTP, SFTP Private Key, SFTP Password, SFTP Password Private Key ). Remote Folder: The folder where store the MySQL backup files on FTP server. The folder must exist before uploading. Protocol: Support FTP ( standard ), FTPS ( Implint SSL/TLS ), FTPS ( Explint SSL/TLS ). Data Connection: Support Passive ( PASV ) and Active ( PORT ) mode. Resume broken transfer: The software will try to upload the MyQL backup files to the FTP server some times and wait for some seconds each time if the first transfer is failed. If the transfer still failed, the software will give up and record the error information. After setting up the options, do not forget to check ftp connection by clicking Test Connection button. Please click Next and choose the Task Scheduler for running the task on Step 7 of Task Wizard to upload the MySQL backup files to your FTP server on schedule. That's all. The software will automatically upload the backup files to your FTP server every time.